At the recent Southeast Deer Study Group meeting (Febr, in West Virginia) there was a most interesting paper presented on the negative impact of baiting on hunter success in South Carolina. Now there is at least one study (Michigan I believe) that showed that bowhunters had higher harvest success rates when hunting over bait, but the South Carolina study showed something a bit different. counties along the Coastal Plain area, where hunters can bait, and they've done so for years. The game agency biologist who gave the paper, first gave some general comments about baiting. He noted that bigger bucks probably are more likely to visit bait at night than in the day. He also noted that if natural foods are high, deer use of bait decreases. He also pointed out the obvious. The general public does not think that hunting over bait is ethical, nor do they feel it is fair chase. You could debate this fair chase issue, but it wouldn't change how the general, nonhunting public, feels about baiting. He also noted that baiting pits one hunter against another. And it does do that. 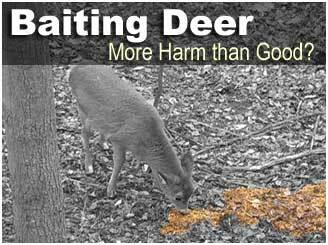 Baiting is viewed as drawing deer away from those who don't use bait to those that do. He also noted that it may take advantage of neighbors with good habitat, by drawing away deer from those lands. In Michigan, there are situations where one person baits heavily on his property, drawing deer off smaller adjacent properties. This then forces those who hunt on small properties to bait. They may not want to, but they get into it so they can see deer. He noted that baiting does little to teach hunting skills. And, though deer may eat lots of bait, baiting doesn't make up for poor habitat. Then he took several years of data from both the baited region and the unbaited region of the state, and made some comparisons. First, he felt the deer density in both regions were similar. He noted that the deer harvest rates in the Piedmont region (unbaited) was 33 % more than the Coastal area (baited). The Piedmont harvest rates of does was 41% higher than the Coastal Plains. Man days per hunter was 20% less in the Piedmont. Man days per deer harvested was 6% less in the Piedmont. So hunters hunt less in the unbaited area of South Carolina and it takes them less hours to harvest a deer than in baited areas. Human population was 33% higher in the Piedmont. Per capita deer-vehicle collisions were 7% less in the Piedmont than where there is baiting. There were lots of variables not mentioned by the author that could impact the results when making such a huge comparison of one group of counties with another.. However, he did make some good arguments that, relative to baiting, deserve some thought. One point is that hunters who use bait become dependent on that for success, while deer behavior in and around baits may change and make harvest more difficult there. His conclusion was that baiting is having a negative impact on deer harvest in the Coastal Plains area of South Carolina. Baiting has been really kicked around since the emergence of chronic wasting disease. And some states that allow baiting for deer, are now rethinking that. My home state of West Virginia, for example, has just proposed to do away with baiting during October and November, starting in 2006. Be interesting to see what hunters there think of that. Hearings are scheduled to discuss this in the near future. We'll hear a lot more on the negative aspects of baiting in the relatively near future. Meanwhile, I thought this paper presented an interesting perspective on baiting that we haven't hard before. Dr. Dave is the Conservation Editor for Bowhunter Magazine and the author of Know Hunting - a must for every bowhunter's bookshelf.